Overall, we feel that in order to take off in a serious way, handheld satellite radios will have to get smaller and cheaper and offer more functions, such as MP3 support and a color screen. (It would be cool to see the album artwork for the songs you hear.) That said, these devices are gaining popularity despite their expense ($299 for the radio and $12.95 a month for the service) and bulk. 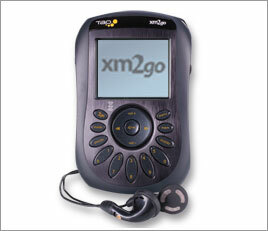 The Tao XM2go is the most rugged-looking and ergonomic of the current crop of products, but they all have identical features and performance. Pros: Cool-looking design. Rugged feel. Buttons are prominent and well placed. Records up to 5 hours of content. Cons: Must be powered off to perform scheduled recordings. Indoor reception isn’t great. Bulky. Expensive. Bottom Line: There’s not much to differentiate this player from other XM2go products, but its black shell certainly gives it the edge in the cosmetics department.